Catherine Elizabeth Richards is an architect and visual artist. Her work expands the understanding of architecture at different scales; from discrete objects, sculpture and installations to city-wide interventions. Richards works between mediums, exploring architecture and perception with materials, experimental photography and video. For example, her piece Valance draws upon the history of glass architecture. This lighted glass sculpture incorporates plant patterns etched directly into the surface. The viewer’s reflection merges with the transparent structure, itself a meditation on inside and outside. Her family’s farm in Michigan, a historic site where botanists developed hybrid species of apples and cherries, is largely responsible for her plant-based references. Valance was first shown in 2014 at ArtPrize in Grand Rapids, Michigan. Richards holds Master of Architecture and Bachelor of Science degrees in Architecture from the University of Cincinnati, College of Design, Architecture, Art and Planning where she now teaches. She is a co-founder of the art collective Hark + Hark, with Anh Tran. Hark + Hark created an installation for Marchon Eyewear in New York City, that traveled to Paris, London, Berlin and Tokyo in 2016 and is now in the company’s permanent collection. 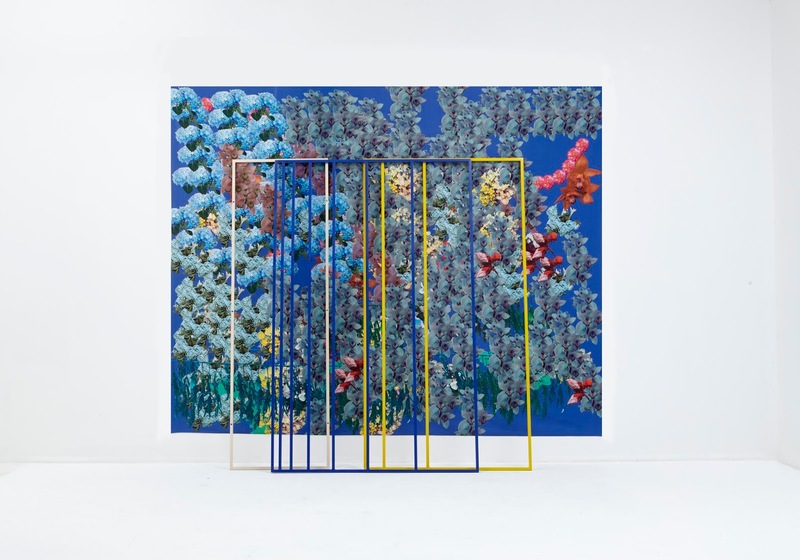 Eva Kwong’s exhibition of ceramics will include free-standing sculpture and sculptural wall installations made from many elements referencing biological sources such as bacteria, diatoms and cells. Smaller pieces reflect her personal interpretation of the traditional vase form. Working in the material of clay, Kwong explores a philosophical connection to the union of opposites. Eva Kwong’s work is included in numerous collections internationally including the Cranbrook Museum of Art, Bloomfield Hills, Michigan; Finnish Craft Museum, Helsinki, Finland; Janet Mansfield Collection, Mansfield Ceramics, Gulgong, Australia; Minneapolis Institute of Art, Minnesota; Shigaraki Park Ceramic Museum, Shigaraki, Japan and Fule International Ceramic Art Museums, Fuping, China. 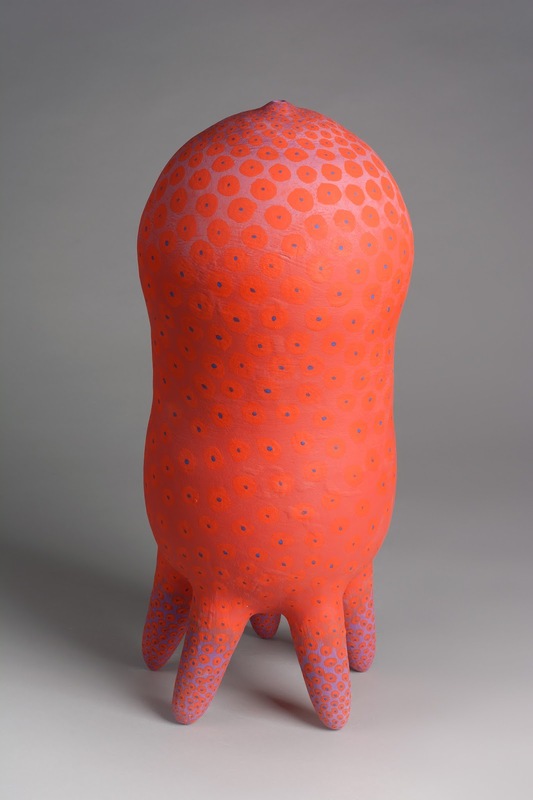 Kwong received an MFA in Ceramics and Drawing from the Tyler School of Art, Temple University in 1977 and a BFA in Ceramics and Sculpture from the Rhode Island School of Design in 1975. 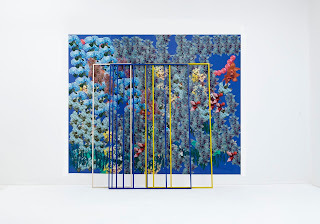 References to the macrocosms and microcosms of the natural world abound in the woven paintings of Hildur Ásgeirsdóttir Jónsson. Painting on silk threads in a process related to ikat, her imagery is loosely based on landscape photographs of her native Iceland. The sources are often close-up images of lichen, but they also abstractly allude to larger swaths of land and sky. 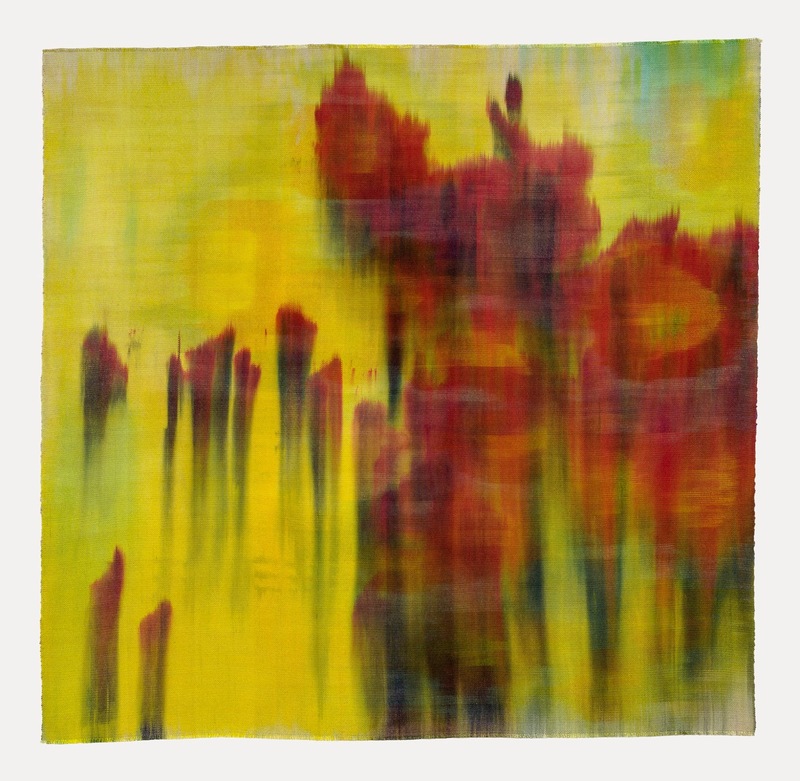 By painting with industrial dyes on the detached warp (vertical) threads of her works, attaching these dyed threads to a large-scale loom and weaving in the weft (horizontal) threads, she creates slightly off register, shimmering woven paintings that suggest expansive space rather than any literal sense of place. Jonsson has received numerous grants, commissions and awards including The Louis Comfort Tiffany Foundation 2015 Award, the Cleveland Art Prize in 2008, four fellowships from the Ohio Arts Council and a public commission from the Hilton Hotel Convention Center, Cleveland in 2016. Her work is included in many collections such as The Cleveland Art Museum, Reykjavik Art Museum, Akron Art Museum, Progressive Insurance Collection and Cleveland Clinic Foundation. Solo shows include Tibor De Nagy Gallery, New York; TANG Museum, Saratoga, New York; Reykjavik Art Museum, Iceland; and MOCA Cleveland. She was also included in the 2015 group exhibition, Pretty Raw: After and Around Helen Frankenthaler at the Rose Art Museum at Brandeis University. Hildur Ásgeirsdóttir Jónsson was born in Reykjavik, Iceland in 1963 and still maintains a home there. She resides in Cleveland, Ohio for much of the year and makes annual visits to Iceland to gather more source material for her paintings. She received MFA and BFA degrees from Kent State University in 1995 and 1991 respectively. She earlier studied at the Cleveland Institute of Art and the architecture program of Kent State University.